1757-1825,Russian painter of Ukrainian birth. Along with Fyodor Rokotov and Dmitry Levitsky, Borovikovsky is one of the three great Russian portrait painters of the second half of the 18th century. He was trained by his father and brothers, who were icon painters. His early works were also icons, such as the Mother of God (1784; Kiev, Mus. Ukrain. A.) and King David (1785; St Petersburg, Rus. Mus. ); they are archaic in style and resemble portraits produced by Ukrainian folk artists. At the end of the 1780s Borovikovsky moved to St Petersburg and took up portrait painting. He was aided by advice from Levitsky and took lessons from Johann Baptist Lampi (i). He soon became established, gaining a reputation as a brilliant colourist, and he received many commissions. Throughout his career, however, he continued to paint icons from time to time. 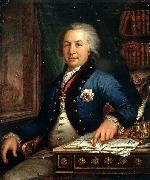 In 1795 he became a member of the St Petersburg Academy of Arts; he was also closely connected with many of the chief exponents of Russian culture in the city. The number of his surviving works is large (at least 400 portraits). He had his own workshop, and he would often rely on assistants to paint the less important parts of a portrait. His sitters included members of the imperial family, courtiers, generals, many aristocrats and figures from the Russian artistic and literary worlds. Most of his portraits are intimate in style. A particularly touching example is the portrait of Ol ga Filippova, the wife of a close friend (c. 1790; St Petersburg, Rus. Mus. ), who is seen in a white peignoir with a park in the background. The portrait is painted in a flowing style; the combination of light, subdued tones, typical of Borovikovsky, gives an impression of tender femininity and quiet contemplation.